Josh built this very unique passive solar home in Missouri. The house incorporates the usual south glazing to gather solar heat and good insulation to reduce heating requirements. But, it also has a unique heat storage capability using the soil under the main floor. And, a unique cooling system that makes use of the same soil heat store. The home has a 2 foot deep earth heat storage bank under the slab floor of the house. During sunny periods, solar heated air from the main floor is circulated through ducts embedded in the heat store in order to store heat for use during the evening. This has the added benefit of reducing the chance of overheating the main floor as sometimes happens on passive solar homes. 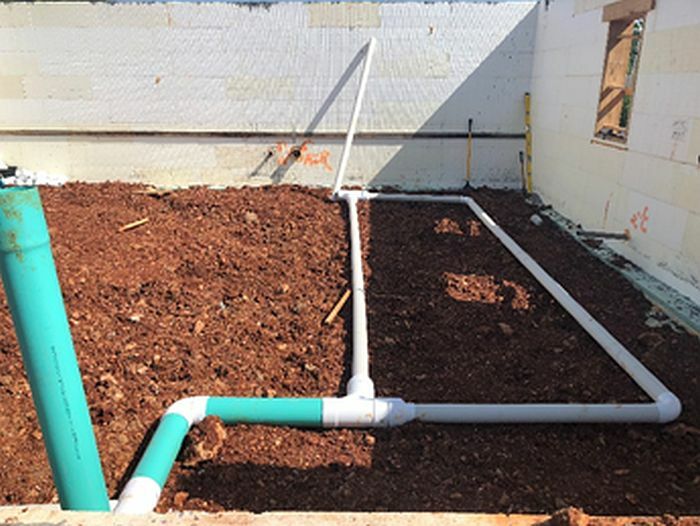 To provide cooling in the summer, cool well water will be circulated through pex tubes embedded in the under floor heat store. Solar heated air is circulated through these under floor ducts to add heat to the heat store. Thanks very much to Josh for providing information on this unique design. Darrel sent in a note on the Rain Harvest Calculator that he has developed and made available free of charge on his website. Its a dandy. Location -- specify your location and the calculator looks up the average monthly rainfall. Well worth having if you are planning a rain water harvesting system. David has designed and built a very nice solar water heating system for his energy efficient home. 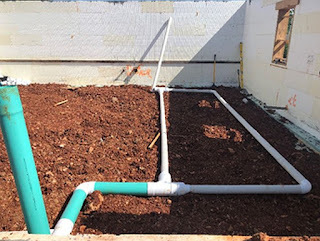 It is a drainback system that uses an EPDM lined, non-pressurized wood tank for heat storage. Tank design suitable for limited height crawlspaces. David's system consists of three collectors mounted vertically on the south wall of his house. The heat storage tank for the system is in the crawl space under the collectors. Its a drainback system, so for freeze protection, the water in the collectors drains back to the heat storage tank when the pump turns off. The collectors were obtained on Craig's list as "new old-stock" for a very good price. The heat storage tank is a non-presurized, wood framed, insulated with polyiso rigid foam, and then lined with an EPDM liner - this is a design that has been used on quite a few Build It Solar projects, and works well. David with heat storage tank in his 29 inch deep crawl space. The heat exchanger uses a 300 ft coil of pex pipe that has been used successfully on several Build-It-Solar projects. The scheme that Dave used to support the pipe coil and space the coils out is very nicely done and likely provides a worthwhile gain in heat transfer efficiency. One nice thing about this style of heat exchanger is that it stores several gallons of fully preheated water right in the coil. PEX coil heat exchanger with nice coil separation and support scheme.